House of Blues Orlando, known for its unique live entertainment and events and mouth watering menu offerings, is proud to announce that it has launched new menu items that are sure to tantalize taste buds and make music in mouths everywhere. Available now, House of Blues’ new menu is taking center stage with a culinary set list of new appetizers, flatbreads, sandwiches and burgers, entrées and cocktails, joining fan favorites and crowd pleasers from its popular Southern-inspired menu. House of Blues Orlando is the city’s premier destination for top entertainment, delicious food and beverages and fun for all guests. Surrounded by touches of contemporary and traditional southern art, House of Blues offers the best of what the area has to offer, from flavorful signature dishes, inspired cuisine and specialty drinks, to free live entertainment and top local and national acts. For more information on House of Blues Orlando, please visit www.HouseofBlues.com/Orlando, or call 407-934-2583. Founded in 1992, the 11 House of Blues are located throughout the United States and form the country’s pre-eminent group of intimate music venues. Each features state-of-the-art sound and lighting technology in one-of-a-kind custom designed environments aimed to bring fans as close as possible to the artists. Every location’s restaurant and bar is adorned with signature original folk-art – part of the world’s largest collection – combined with the House of Blues legendary hospitality and tantalizing southern-inspired cuisine. Buffet’s usually get a bad rap, and with good reason. Most of them offer large quantities of food at a decent price, but the food is usually two grades above slop level. I've always held to the idea that a high quality Vegas style buffet would do well in Orlando. One with quality selections of chef carved meats and live action chef stations with enticing sides like one might find at the Bellagio. 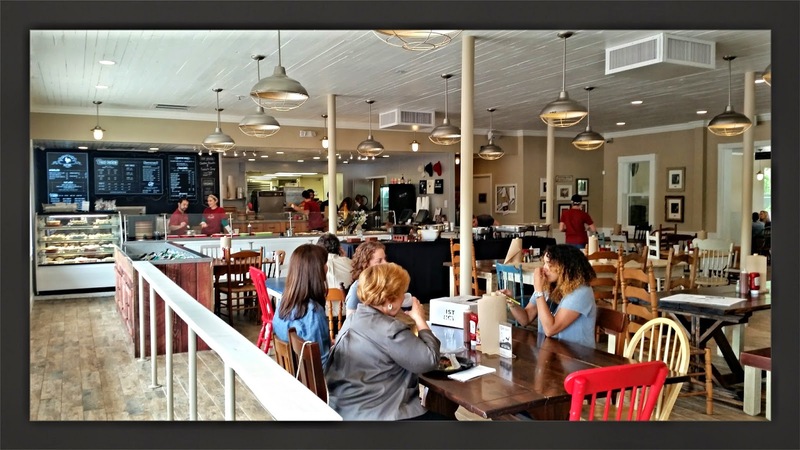 Fred’s Market isn't quite on that level, but what it does do, it does fairly well. Fred's Market Restaurant serves up a taste of farm to plate freshness, with food that is slowly cooked in a natural and unprocessed way. The restaurant aims to provide a cozy atmosphere full of warmth and fun. It's southern comfort food that's pure and hearty all the way to the core. The buffet for dinner is full of traditional southern fare like Fried Chicken, Pot Roast, Pulled Pork, Chicken Pot Pie and a host of sides like Mac & Cheese, Collard Greens, Mashed Potatoes, Fried Green Tomatoes, and of course an extensive salad and soup bar with a dessert bar as well. Fred’s also offers a weekday and weekend breakfast buffet as well, with biscuits and gravy, eggs, bacon, hashbrowns and you can even get the famous fried chicken in the AM. Fred's Market took over the recently closed Romano’s Macaroni Grill. aside of a few touches here and there, the inside and outside is relatively unchanged from the previous tenant. The salad bar has something for everyone. There are plenty of fresh fruits and an assortment of fruit and vegetable salads on the buffet. I really enjoyed the broccoli salad, as well as the apple raisin salad. All of the food I tried was pretty good, but the Fried Chicken here is the star of the show. Dare I say…it could be some of the best fried chicken in Central Florida? A variety of southern comfort side dishes. It doesn't get any more southern than banana pudding, red velvet cake and pumpkin pie. Here is a loaded plate with fried chicken, mac & cheese, mashed potatoes and a fried green tomato. 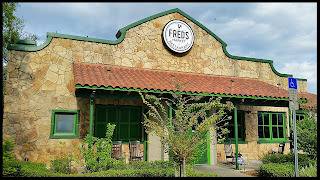 Overall, I was very impressed with the food at Fred’s Market. All of the food was fresh and seasoned very well. If you are looking for some good southern comfort food at an affordable price in a family friendly atmosphere, stop by Fred’s Market. A little over a month ago, I had the opportunity to attend a grand opening celebration for John Rivers latest culinary creation, The Coop. For those of you not familiar with the name, the same owner and team behind the famed 4 Rivers Smokehouse brand is also behind The Coop. Since its initial opening, there has been a great debate brewing among foodies and food bloggers alike about the "Fried Chicken" at The Coop. I wanted to make sure I got the full experience and taste the chicken independently, so I waited a little while before returning for my recent lunch visit. The idea of The Coop is to serve up southern hospitality and classic comfort food made from scratch with a down home feel. That down home we are speaking of is South Carolina Low Country, where the family of John Rivers has its roots. Low Country cuisine is traditionally associated with parts of South Carolina and the Georgia coastline. Most of what we call "Low Country" cuisine shares cooking styles with traditional Southern style cooking, but has strong similarities to Cajun cuisine. A lot of the menu at The Coop is based on handed down family recipes that use fresh and seasonal ingredients that bring together the best of both worlds. There are plenty of Southern options available like Fried Chicken served in a variety of ways, Meatloaf and Chicken & Dumplings. Some of the signature "Low Country" items include a Fried Fish Basket, Low Country Shrimp and Grits and Po'Boys with a selection of fillings. The inside is very eclectic and features purposefully mismatched wooden tables and chairs. It is rumored that John Rivers even went so far as to hunt down those tables and chairs from Craigslist. It gives The Coop a very unique feel, like sitting inside someones home for a family get together in Charleston South Carolina, if you've ever been. 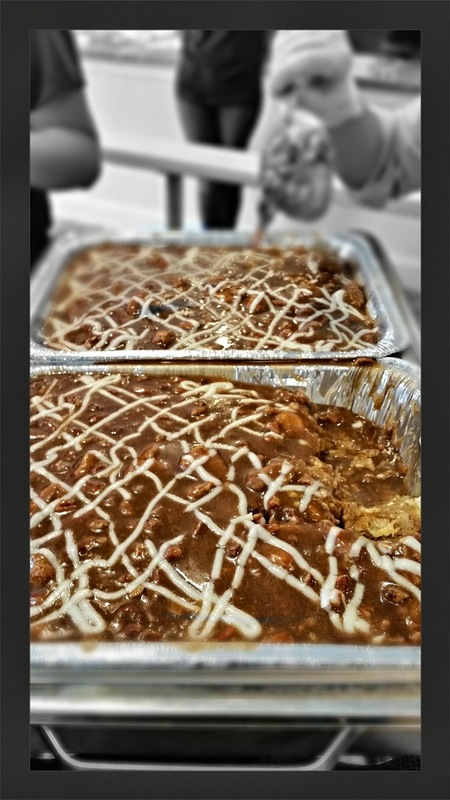 The Cinnamon Roll Bread Pudding was luscious and creamy, but firm at the same time. I sampled this during the grand opening, and it was a real treat. 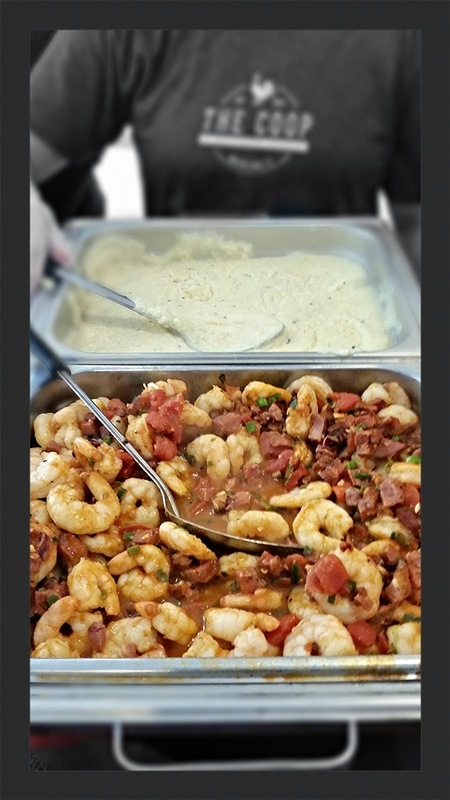 Another dish I sampled at the grand opening was the Low Country Shrimp and Grits. 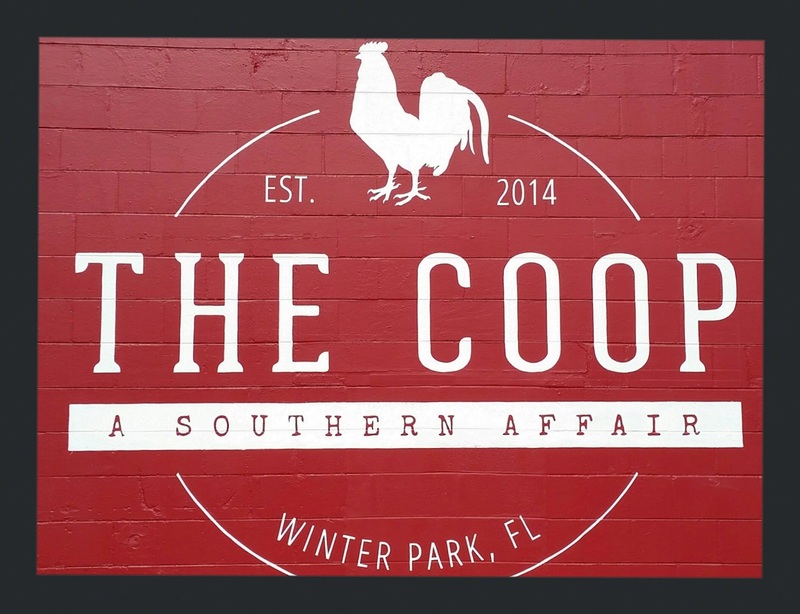 Since it is hard to find Low Country cooking in Orlando, I really enjoy when I find somewhere that does it right, and The Coop does. The shrimp and grits have a mild earthy flavor with just the right amount of seasoning served with creamy grits. John Rivers told me he uses Tasso Ham to kick it up a few notches. Some other items I sampled included Biscuits and Gravy, Deviled Eggs, Pecan Pie and Pimento Cheese Spread, all of which were very good. So...Lets get back to that great Fried Chicken debate. On my recent visit I ordered the Two Piece Plenty Plate. That included a wing, a breast, and two sides that came in at just over $10.00 with a drink. Sadly, as of right now, I have to tell you that the Fried Chicken at The Coop is just kind of average. I have to go with a tired and old cliche and say..."It depends on what your definition of Is...Is". My overall experience was that it really lacked any flavor at all, except for the large chunks of pepper. The batter was nice and crispy but my breast was a little dry. I found myself having to add table salt to the chicken just to taste it. I personally love pepper and spicy foods, but for someone with a more sensitive palate, the excess pepper would make this fried chicken a no go. Expectations can be a great thing, but they can also be a detriment when we build them up too high. Most people, myself included, thought John Rivers was going to take fried chicken to another level, much like he did with his famous 18 hour smoked beef brisket at 4 Rivers. Unfortunately that's not the case at The Coop, and a lot of folks feel let down. There is plenty of great food available here, and almost everything else I've had has been wonderful. I really enjoyed my side of three cheese macaroni and the coleslaw, but at over $10.00 for a two piece meal...I really needed to be wowed by more than just my side items. Something else I noticed that I am not happy about, is the fact that the Chicken and Waffles come with fried chicken tenders instead of bone in chicken pieces. Most of the press clippings I saw prior to opening were all in a buzz about the possibility of The Coop featuring authentic Southern Chicken and Waffles with bone in chicken. 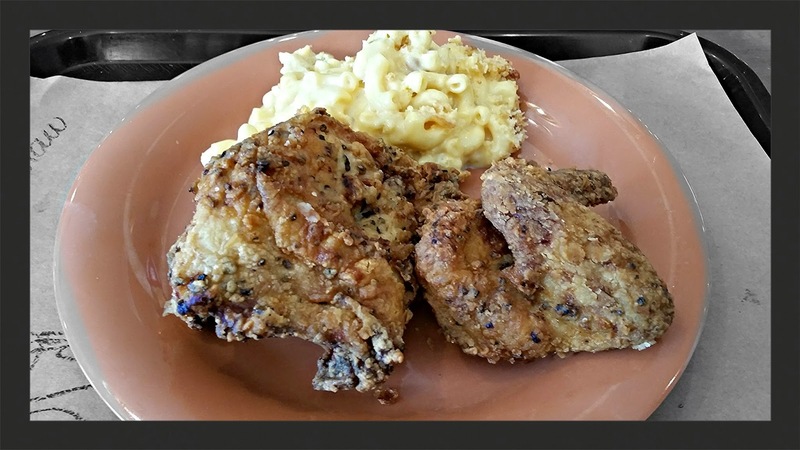 I can get chicken tenders and waffles at I-hop, and I was really looking forward to something more along the lines of Roscoe's House of Chicken and Waffles or even Hattie B's in Nashville, but again we must use caution on our expectations. Overall, I like The Coop. Its decor is very inviting and charming and gave me a real feel of eating at a South Carolina family members home. The food for the most part is good, and service is always friendly and helpful. Perhaps sometime in the not too distant future, The Coop will revisit its Fried Chicken recipe and give us something to go crazy over.